Citigroup is the first big bank to report fourth-quarter earnings that disappointed investors. Citigroup failed to live up to Wall Street's expectations Thursday as it reported fourth quarter earnings that fell short of estimates. The bank reported a gain of 82 cents per share (backing out one-time gains and charges) on revenues of $17.8 billion. Analysts had expected Citigroup (C) to post a profit of 95 cents per share on revenues of $18.2 billion, according to FactSet. Although net income was up sharply from a year ago to $2.7 billion, revenues for the fourth quarter were down 1% from the same period a year ago, Citigroup said. 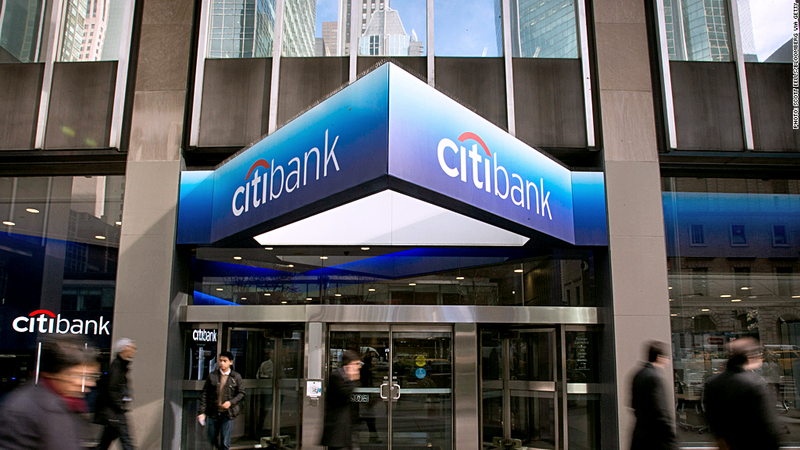 Shares of Citigroup (C) fell over 4% in afternoon trading. Citigroup said its retail banking revenue dropped as higher interest rates slowed its mortgage financing business. Investment banking revenues, derived from activities such as underwriting initial public offerings and advising companies on mergers, were up from a year earlier though. And a strong stock market helped offset a tough quarter for bond-trading, the bank said. On a conference call to discuss earnings, Citigroup CEO Michael Corbat said fourth quarter performance "reflected an ongoing challenging environment." He said rising interest rates and elevated legal and regulatory costs weighed on results. But structural changes as well as an increase in loans and deposits should position the company for more robust growth in 2014, Corbat claimed. Still, he acknowledged some impatience on the part of investors. "Being pleased with our progress doesn't make us satisfied and it doesn't make our shareholders," he said. Jeff Morris, head of U.S. equities for Standard Life Investments, which manages almost $300 billion, characterized Citi's earnings as mixed. He said that while bond-trading was "clearly disappointing" and that high expenses dampened profit, the bank showed strong international consumer loan growth. "This quarter was really a tale of two Citis," he said. Daniel Marchon, an analyst with Raymond James Financial who covers the bank, thinks Citigroup may have dialed back some risk in the fourth quarter ahead of its stress test with the Federal Reserve scheduled for early this year. The stress tests are meant to help the Fed gauge how the banks would fare in another financial crisis. Citigroup's results surprised investors, as its competitors all reported strong earnings this week. Goldman Sachs (GS), Bank of America (BAC), JPMorgan Chase (JPM), and Wells Fargo (WFC) all beat analyst forecasts. JPMorgan, Wells Fargo and Bank of America did so despite experiencing a similar drop off in mortgage lending due to higher interest rates. Investors have poured into financial stocks in the past year, betting that a growing economy will boost profits. The financial sector is expected to have the best profit growth in the fourth quarter, according to FactSet Research. Overall, earnings for the companies in the S&P 500 are expected to be up 6.1% versus the fourth quarter of last year. Like other banks, Citigroup has clawed its way back since the depths of the financial crisis. But investors' expectations are now much higher for Citibank and all of its Wall Street rivals.